Provides on-line medical records for horse owners enrolled through your practice. Complement your email reminders with EquiHealths Postal Reminder Cards. Choose from a variety of eye-catching designs on your provider portal and set other preferences. EquiHealth is integrated with VetSource home delivery. Owners can manage their horses prescription and food deliveries and shop directly from their EquiHealth portal. Now you can offer an extensive collection of equine health articles from your website. The information your clients need is just a click away 24/7! With several high quality videos, you can now make client education easy and fun. State-of-the-art animation and video tell a compelling story! Now your clients can understand their horses in a whole new way. Our interactive horse will amaze and educate your clients. EquiHealth is integrated with GlobalVetLink to provide electronic access to Coggins certificates. Owners have the ability to view, print and email Coggins certificates directly from their EquiHealth portal. Customize the clients view to only include medical records and/or notes allowed by the Doctor. Improves health schedule compliance and customer loyalty. Reduces overall time and cost associated with calling, faxing, mailing or emailing medical records. Keeps information up-to-date by emailing your practice when clients change their contact information, horses picture or other information. These updates can then be entered into your practices PMS system. Increases profit through improved health schedule compliance and/or charging an annual fee to enrolled clients. Patients records can be viewed by the Doctor while away from the office or during a natural disaster. Ability to manage health schedules, view upcoming appointments, or follow up on healthcare recommendations. 24/7 access to the required medical records needed for traveling, enrolling in classes, or in an emergency. Enrolling owners and managing EquiHealth within your PMS system is easy. Clients are enrolled by simply entering their email address into your practices PMS system. Once a client is enrolled they will receive an email encouraging them to register and informing them of the benefits of using EquiHealth. Records are safe, secure, and can only be viewed with an email address and private password. These services help your practice save time and money by automating daily, weekly, and monthly marketing tasks. Reminders: Health reminders are sent to all clients enrolled in EquiHealth or who have an email address in a practices PMS system (clients can unsubscribe if they do not wish to receive email reminders). Reminders can be emailed twice up to 30 days prior to upcoming health schedules and again at 30, 60 and 90 days overdue. Emails are branded with a practices email address, name, phone number, and are personalized with the horse's name. Using Reminders is a cost effective way to increase health schedule compliance. Appointments: Appointment reminders are sent 2 days prior to upcoming appointments to all clients enrolled in EquiHealth, or who have an email address in a practices management software. These reminders can now be sent via automated Email or Text (SMS) message. Clients can easily confirm Email and Text message appointments with one-click confirmation and your practice will be notified via email. Surveys: Improve client satisfaction and increase referrals by allowing customers to provide important feedback about a recent visit. Choose from our standard survey questions or create your own customized survey. Clients will automatically receive an email survey 2 days after a service has been invoiced and the results will be emailed to your practice. Clients can choose to submit surveys anonymously or request a follow-up email or call. Newsletters: Newsletters are a cost effective and efficient method of communication for your entire practice or a small target group. Emails can be personalized using the clients first name, last name, or horses name. Use Newsletters to introduce new products or services (i.e. 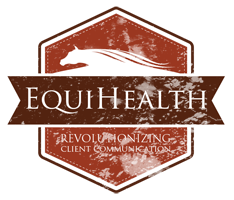 EquiHealth), share health news & tips, inform clients about new practice information, offer promotions, etc. Coupon Builder: Provide personalized, professional promotions and discounts through Coupon Builder! Create custom coupons with your practice logo and apply them to Marketing materials. The coupons include a custom message, can be set to expire and you can decide to which Marketing files youd like them applied. Whether youre running a wellness campaign or a seasonal special, coupons are a great way to attract your clients attention and increase visits. 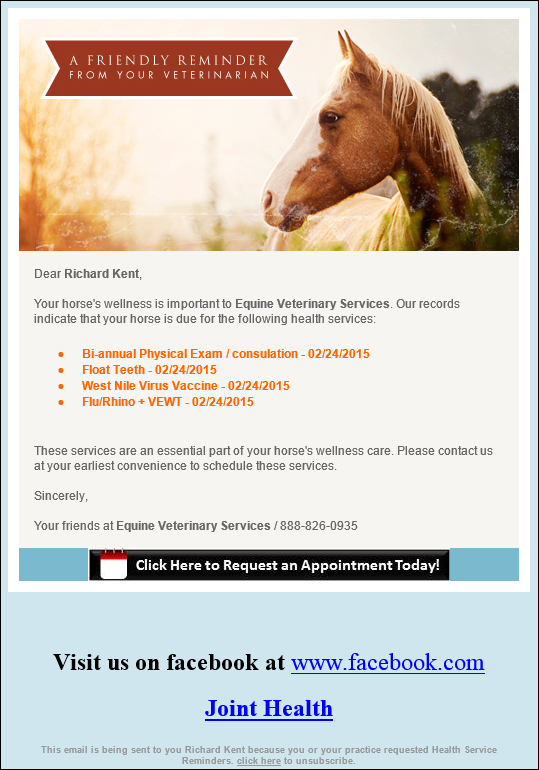 Bring more clients through your doors - and exert less energy doing so, with EquiHealth Postal Reminder Cards! Cards include your hospitals return address and practice information, as well as client mailing address. VetSource is reshaping the way you deliver medicine. This exciting service allows you to provide both traditional and proactive home delivery services. Owners will be able to either browse your website for products or be automatically enrolled for monthly shipments before leaving the practice. VetSources Remind Me program allows you to recapture lost revenues from non-veterinary online pharmacies while boosting client compliance. Owners will also be able to manage and track their horses medication and food shipments from within the EquiHealth portal. To learn more about our home delivery option, please visit vetsource.com or ask your Patterson representative for more details. Offer your clients 24 hour access to a library of health articles for timely information on important topics. Our database of articles are illustrated and can be easily searched. Articles can also be printed for later review. An interactive horse can be opened to explore body systems and learn how different areas of anatomy can effect an horses health. Laminitis, colic, corneal ulcers and dental issues are just some of the topics that can be explored. All of these fascinating features can be integrated directly into your website or accessed at EquiHealth.com! EquiHealth has teamed with GlobalVetLink, a well-known provider of electronic laboratory forms, to provide your clients with 24/7 access to EIA/Coggins tests. Horse owners will be able to open and print completed tests through the medical record page of their EquiHealth portal. Coggins’ USDA-approved electronic forms prepare you for domestic and international movement of horses with no more carbon-copy forms. The service is integrated with several practice management software systems and allows users to report data in real time, eliminating the time wasted through traditional form submission. In addition to real-time data reporting, digital photos improve identification and make hand-drawn markings a thing of the past. The photos are stored in the database and new photos are needed only if the horse changes in appearance. *Practice must be an active GlobalVetLink subscriber to provide horse owners with access to EIA/Coggins tests.